Dimensions (HxWxD): 1.4" x 1.25" x 0.5"
This beautiful, uncut, natural 1.5 ounce Star Ruby Short Wand, measuring approximately 1.4 inches long, is the perfect size to put in your pocket or medicine bag, to hold in the hand during meditation or to place on the body of a client during crystal healing sessions or energy treatments. Carry a ruby to increase unconditional love from within and without, to follow your bliss, to stablilize your wealth and safeguard your well being in tumultuous and conflicted times and places. The ruby is a beautiful, brilliant gemstone in the corundum family, which includes the sapphire. The ruby is the hardest and most expensive gemstone other than the diamond. The rough ruby appears lusterless and manifests quite often as hexagonal prisms and rhombohedral shaped crystals. The ruby exhibits a color range from pink, crimson and red to orange red, and has been a favorite of royalty -- and of spiritual adepts --for millennia. 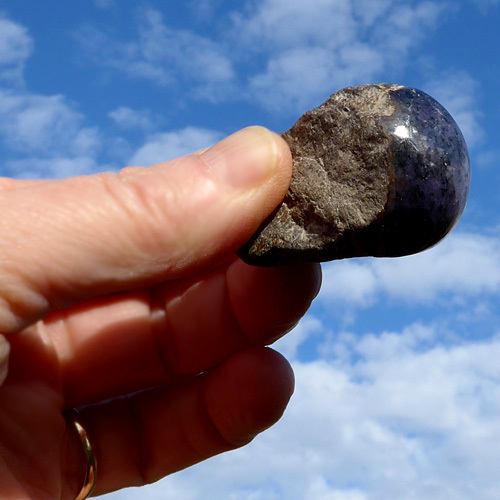 The Star Ruby is an extremely rare variety of ruby that exhibits a quality known as asterism. Inclusions of rutile needles, composed of titanium filaments, and/or inclusions of hematite beneath the surface of the gemstone are arranged in a pattern that reflects streaks of light onto the surface of the gemstone. Depending on the orientation of the streaks, a Star Ruby can display four, six or twelve sided stars. Sometimes a Ruby will exhibit inclusions that reflect light upon the surface, but the orientation of the inclusions results in a visible light beneath the surface of the stone which mineralogists call silk. The Star Ruby normally displays a different color range from clear ruby gemstones. Because of the inclusions, Star Rubies tend to be pinkish-red, purplish-red, or brownish-red in color. In the Hindu Vedas, the most ancient sacred Scriptures known to man, the ruby is called "ratnaraj", the "king of precious stones" and "ratnayaka", "leader of precious stone". The Masters of the Ancient Wisdom Teachings attributed the ruby's brilliant red hue to an inextinguishable fire within the stone. Ruby is an extraordinary stone for opening the heart chakra and creating a feeling of physical security in an uncertain world, because the ruby's red color resonates with the red color of the root chakra in the Western chakra system, and the ruby is also associated metaphysically with the heart chakra. The ruby resonates to a very high frequency of unconditional love and is known as the "stone of nobility" . In both Vedic teachings and medieval Christian mystery school traditions, the ruby conferred safety, security and peace to the bearer, even in the midst of war, turmoil and cultural upheaval, and was thus very highly prized by the warrior class of nobles in both East and West. Further, the ruby has been used to attract wealth. It has been said that if one has ruby, wealth will never depart. Metaphysically, the ruby encourages us to follow our bliss, bringing clarity to our mental state, lucidity to the dream state and helping is to make sense of this in the physical realm. The ruby also has healing properties for the heart, in aiding in eliminating toxins from the body and in it's ability to help to heal the earth. 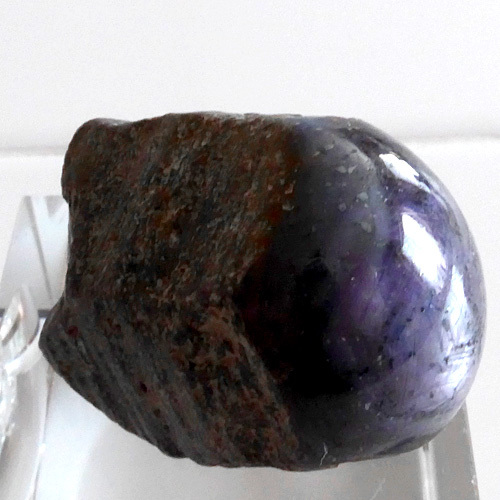 It is a deeply balancing stone, helps to eliminate stagnant energies from our physical and etheric bodies and helps to align us with Love toward ourselves and others. This Ruby may enhance your ability to strengthen the flow of Universal Life Force energy through mind, body and aura, helping you to access love, protection, abundance and prosperity, helping the bearer to attract that which is most desired in conformity with Higher Mind and Higher Purpose. 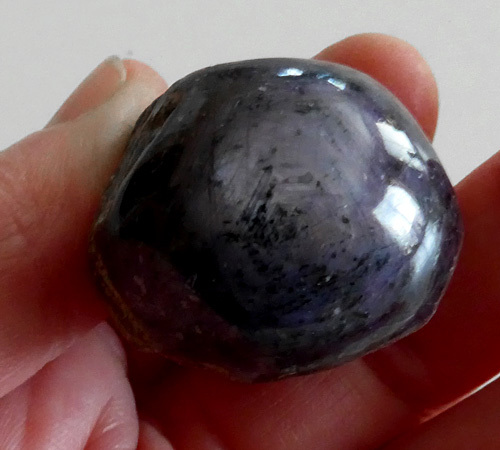 This gemstone has been cleaned and charged with Universal Life Force Energy, and given an energetic attunement using Reiki, a Japanese technique of energy healing so it will continue to channel and transmit Universal Life Force Energy direct from the Source of Creation. It has also been cleaned and charged with the natural energy of sunlight. It is ready for you to program according to your own needs and desires. Use this powerful Star Ruby gemstone with loving care and respect its long evolutionary journey deep in the Earth, which has developed its unique metaphysical properties and beautiful appearance. Note: weight above is shipping weight. Net weight averages 44 grams or 1.55 oz. Size varies slightly but is approximately 1.375" in length. Each piece is natural and unique, so size and appearance may vary slightly. Each Star Ruby is carefully selected for you and we only choose the ones we'd like to have ourselves. Each one is guaranteed to be beautiful and to meet with your complete satisfaction!